What is really going on in May Sinclair’s review of Dorothy Richardson’s Pilgrimage? The phrase ‘stream of consciousness’ had never before been applied to a work of literature, and the metaphor was to catch on. May Sinclair had taken the idea from contemporary psychology. It is usually attributed to William James, who in his Principles of Psychology (1890) dismisses metaphors that compare thought to something jointed or ‘chopped up in bits’, and insists that consciousness instead is a flowing thing like a river or a stream: ‘let us call it the stream of thought, of consciousness, or of subjective life’.3 However, Sinclair may not have borrowed the idea directly from James. As Suzanne Raitt points out, the phrase was widely used in the early twentieth century, with many of the texts Sinclair references in both Mary Olivier and A Defence of Idealism using the phrase ‘as a matter of course’.4 What Sinclair did do was link the phrase ‘stream of consciousness’ with the emergent psychological novel, and the label has been a feature of discourse about modernism ever since. The lack of authorial interference, the narration of consciousness, and the modernist fragmentation are all highlighted. Pilgrimage’s significance, for Sinclair, lies in the way these techniques recreate the ‘conditions that life imposes’. Miriam’s ‘stream of consciousness’, however, is not the point here. May Sinclair is after bigger game. The limitations and the opportunities offered by narrating a novel entirely through the character’s consciousness in this way, are, above all, the best way of getting close to reality. Reality, Sinclair intimates, is what all modern novelists are striving for. In the first passage, the ‘external world’ is what matters: its majesty and importance make people and conversation seem ‘incidental’. In the second, the thing that matters is ‘light’, and in the third it is ‘something’ which lies beneath the chatter of the world, and which happiness reveals. This ‘something’; this ‘light’, is reality. It is reality which is known ‘only at moments’, but which is nevertheless ‘always there, waiting and looking on’. Mary’s philosophical study has given her names to describe reality, but it has made her forget to notice it. Sinclair had played with this idea before: as early as The Divine Fire, she shows the young Savage Keith Rickman being persuaded he has to choose between ‘life’ (‘the fugitive actuality’), and the ivory-tower of his genius.11 The young Mary Olivier’s reality is also ‘fugitive’, coming only in ‘flashes’, but maturity enables a clear sight, much as Richardson’s reality had ‘come to the surface and was with her all the time’. 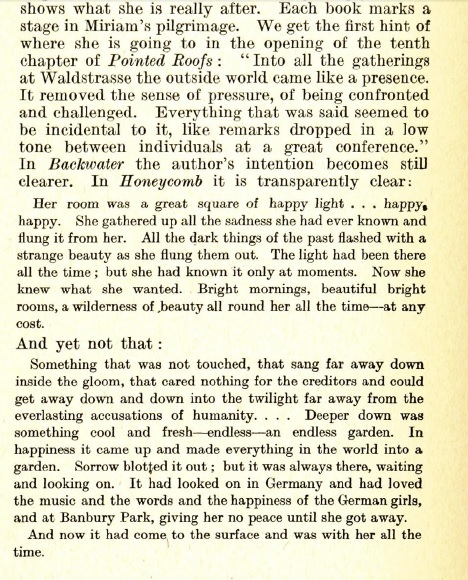 1 May Sinclair, ‘The Novels of Dorothy Richardson’ in The Egoist, Vol. 5, No. 4, (April 1908), p. 57. 2 The Egoist, p. 58. 3 William James, ‘The Stream of Thought’  in The Principles of Psychology Vol. I ed. by Fredson Bowers, Frederick H. Burkhardt and Ignas K. Skrupskelis (London: Harvard University Press, 1981), p. 233. 4 Suzanne Raitt, May Sinclair: A Modern Victorian (Oxford: Clarendon Press, 2000), p. 219. 5 From an ‘autobiographical sketch’ in Authors Today and Yesterday, ed. by Stanley J. Kunitz (New York: The H.W. Wilson Company, 1934), pp. 562-564, p. 562. 6 Letter to Shiv K Kumar, 10/08/1952, box four, Dorothy Richardson Collection. General Collection, Beinecke Rare Book and Manuscript Library. 7 The Egoist, p. 57. 8 The Egoist, p. 58. 10 May Sinclair, Mary Olivier: A Life (London: Virago Press, 1980), pp. 377-8. 11 May Sinclair, The Divine Fire (Toronto: William Briggs, 1904), p. 40.